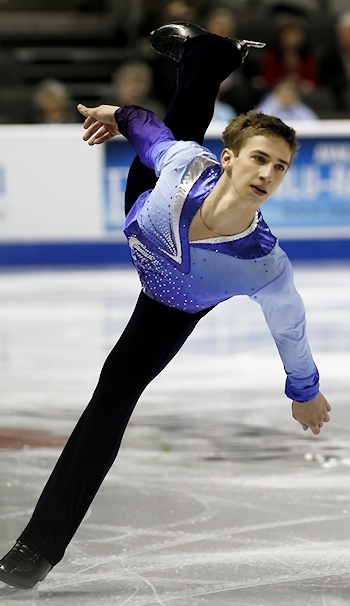 Timothy Dolensky performs his Short Program at the 2012 U.S. Figure Skating Championships. The 2012 U.S. Figure Skating Championships continued Sunday with the junior men’s short program – the final event of the day. Last season 19-year-old Timothy Dolensky watched the junior men’s competition at home, failing to qualify for the event after a disappointing performance at the Eastern Sectional Championships. This season, armed with a piece of music that he composed himself, Dolensky finds himself at the top of the leader board after the short program in San Jose, Calif. In his program, which he appropriately named Windfall, the Kennesaw, Ga., native, opened with a strong triple loop-triple toe loop combination. Dolensky also landed a triple Lutz, and earned level four on all of his spins to just eke out the win with 63.20 points. He leads two-time novice men’s champion Nathan Chen by .05 points. Chen, 13, skated an age-appropriate program to music from the film Wall-E, and won over the crowd with his playful robotic choreography. Chen opened with a playful step sequence, and then landed a nice double Axel. The Salt Lake City native’s triple flip-triple toe loop combination was effortless, and he closed out the jump requirements with a good triple Lutz. Chen earned 63.15 points for his efforts—his highest score at the U.S. Nationals. In third place is 20-year-old Timothy Koleto from Colorado Springs, Colo., with 59.18 points. Koleto did give a clean performance, with a double Axel and triple Lutz, but his triple loop-double toe loop combination kept him from challenging the leaders. “I just tried to do what I train to do,” Koleto said. “I was able to stay level-headed and focused. In fourth place is another skater from Colorado Springs, 16-year-old Lukas Kaugars with 57.96 points. Kaugars landed a slightly flawed triple flip-triple toe loop combination as well as a nice triple Lutz, but was unable to keep pace with the leaders based on his level one and two spins. Philip Warren, 18, from Redlands, Calif., finished in fifth place with 57.42 points, while 17-year-old Jay Yostanto—the only competitor to land a triple Axel in the competition—is in sixth with 54.72 points. The junior men’s champion will be crowned on Tuesday evening.